Can I have a confessional with you about these “Phenomenal” Milk Chocolate Chip Peanut Butter Cookies? I’ve been bad. Very, very bad. Oops, I did it again! 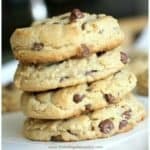 How many times have you been tempted and became a cookie monster and couldn’t stop yourself? That’s what happens when you make eye contact with these heavenly, fudgy peanut butter cookies. 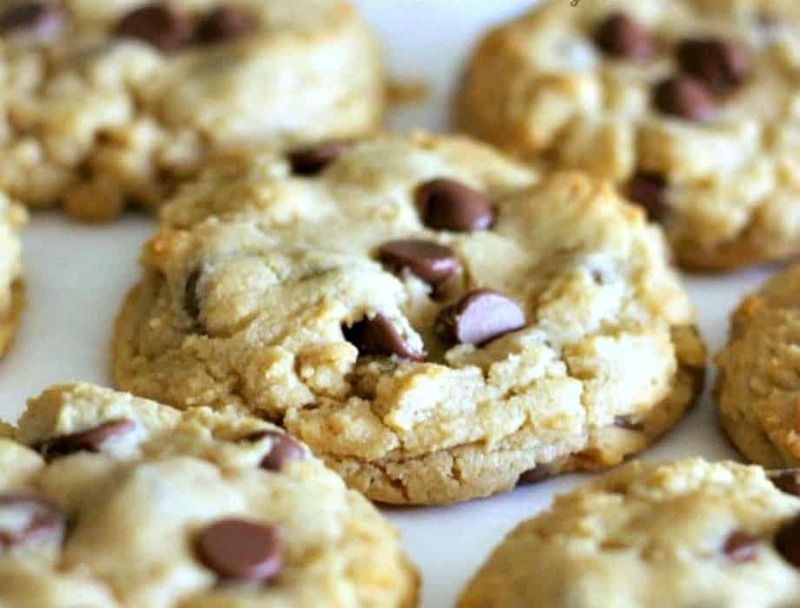 They are so soft, so thick, and have milk chocolate chips galore. So, since we are talking confessionals, do you also have an obsession with peanut butter and chocolate? First of all, if it has chocolate in it, I’m there! But you add that other evil twin in, (ya know, peanut butter) and you’ve got a willing, no-regrets pb & chocolate foodgasm going on here. 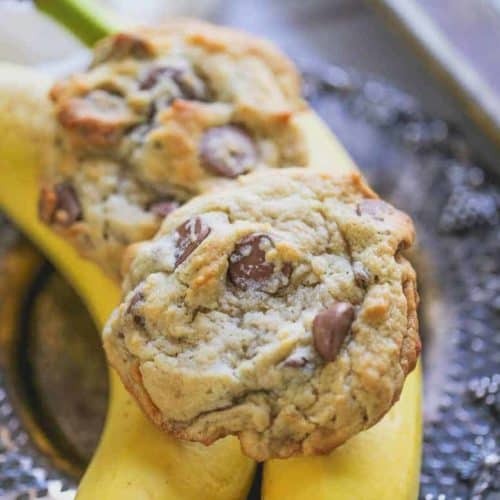 Once I ate these, I could not stop thinking about these peanut butter & chocolate chip cookies. 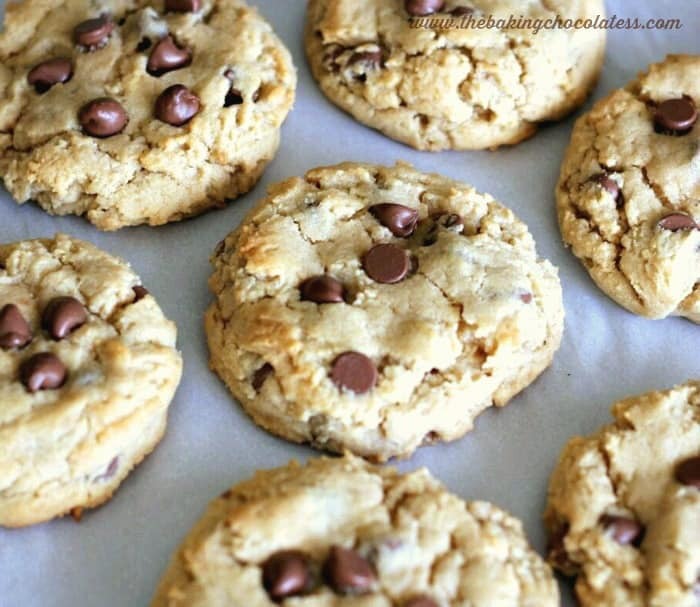 I need to make some more of these “Phenomenal” Milk Chocolate Chip Peanut Butter Cookies – like now! Are you with me? Totally addicting. They will not disappoint! These are wonderful for gifting too! 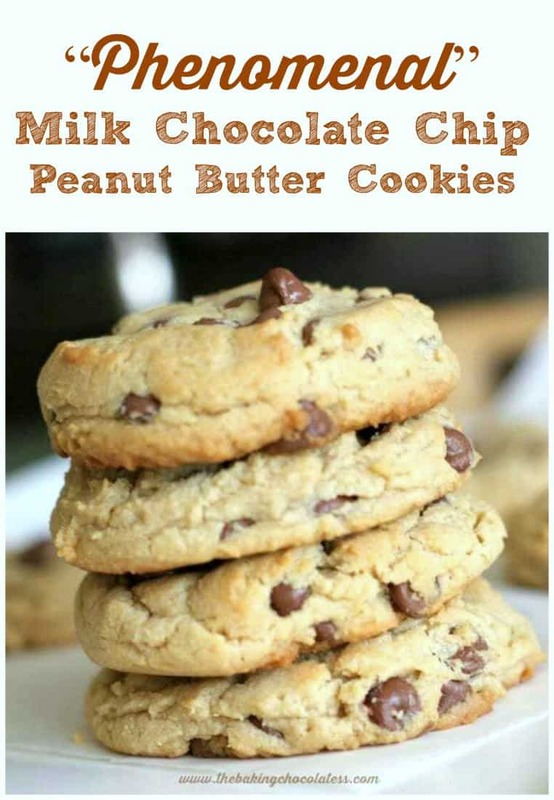 Here’s some more scrumptious Peanut Butter and Chocolate recipes you might like! Hello! 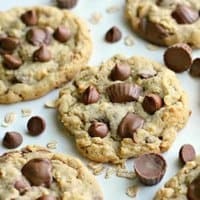 Big soft, thick and fudgy peanut butter cookies loaded with rich milk chocolate chips! Trust me, these cookies are not going to last long! Using a mixer, mix the butter, sugars, peanut butter, eggs and vanilla together until combined. Add in the flour, soda, and salt in and mix until just combined. Use your hand and slightly flatten each scoop of dough. Cook for 12-14 minutes at 350. Remove cookies from oven and cool on baking sheet 2 minutes before placing on cooling rack. 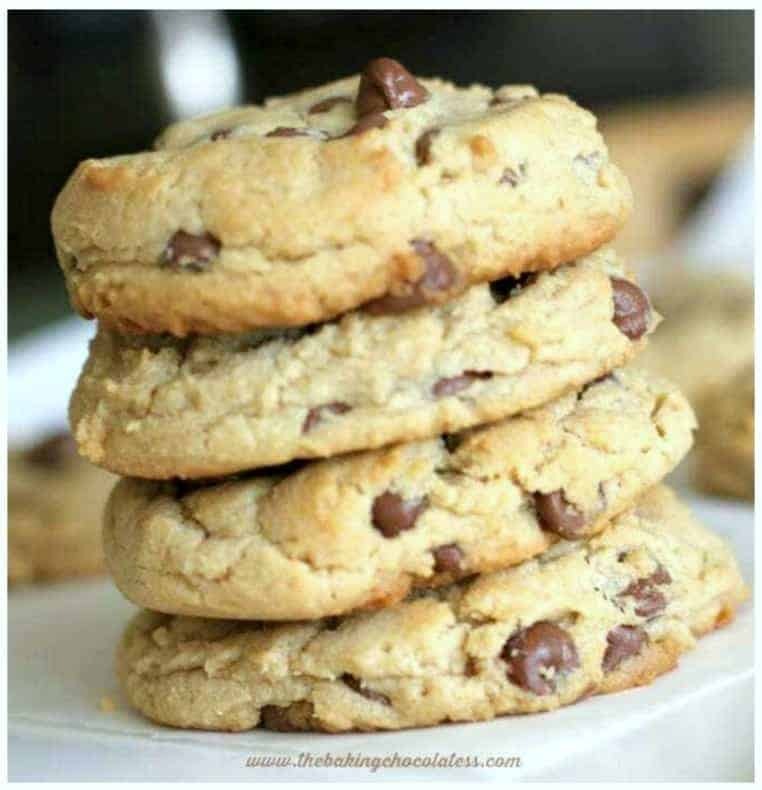 If you want to reserve about a 1/2 cup of chocolate chips, you can lightly press 4-6 chips into the tops of the cookies so you can visually see more chocolate chips. 🙂 I love doing that! Make sure you don't over-measure your flour. You should spoon your flour into your measuring cup and then level it off. Oh goodness, these would be very enticing to my son on his midnight raids!!! Thanks for having such great recipes!! Followed exactly twice and both times they came out super dry. Trying less flour next time. Kaylee, I hate to hear that. ;( I wish I was there to see. 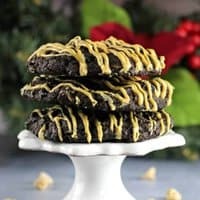 I hope that works for you, I know when I get a dry cookie, it’s usually too much flour, or overbaking as the top reasons. Good luck dear, fingers crossed! Cookies came out perfect. I followed recipe exactly. It was a big hit at my house. Thank you for the recipe. I will definattely be making these again. Made these a few months ago. My daughter asked me to make them again. Followed the directions, expect a few adjustments. We just used regular chocolate chips. And also we did a peanut butter overload. We added Reece’s peanut butter cups. I cup the cups vertical into pieces, After taking the cookies out of the oven I pressed pieces of the peanut butter cups and a few extra chocloate chips onto the cookie. Can’t wait to make these again !